William Pitts, a born entrepreneur, has exhibited leadership skills and business acumen since early childhood. At ten, he launched a lawn care service and ran it with equipment he created himself: a wheeled cart attached to a go-cart. He says that by age 16, earnings exceeded those of many adults! While in college at Lee University, he owned and managed ‘Precision Tile’, a company that performed residential and commercial construction in Tennessee. Around the same time, William was elevated from part-time server, to manager, at a restaurant concept called the ‘Bald Headed Bistro’. There, his passion and love for the hospitality industry began. The country music mecca came calling when ‘B.B. King’s Blues Club & Grill’ hired William away to become general manager of their Nashville location. Following that role, he traveled the Southeast as GM for various restaurants and brands. In hopes of returning to Atlanta, William pursued an opening with Café Intermezzo — an opportunity he found intriguing, as it represented something much more than just another ‘job’. The reason for that is a memory in the coffeehouse that he’ll never forget. When William was 14, his dad asked him to meet at Café Intermezzo in Dunwoody, as it was his favorite place to visit when traveling from his hometown of Baltimore. There, his father delivered the news that he’d been diagnosed with a terminal medical condition. With heavy hearts, hugs were exchanged before each headed home. Shortly thereafter, his dad’s condition took an abrupt turn for the worse, and William lost his father without getting the opportunity to see him again. With that memory ingrained in his mind, William was happy to forge a closer tie with the company, first joining our concept as Director with Café Intermezzo’s airport licensee. During that time, he and founder Brian Olson formed a close bond and mutual respect for each other. That rapport, combined with William’s proven success, eventually lent to his being offered and accepting the role of Chief Operating Officer. He finds a sense of peace knowing that his last, unforgettable moments with his father were spent at a place and company he would one day proudly help grow. Passionate about Intermezzo, William set his sights on furthering the foundation that had been laid by Olson over the three decades prior, with a vision of growth fueling his efforts. Through the next four years, his contributions led to his promotion to Chief Executive Officer. While away from work, William and his wife, Emily, enjoy contributing to community affairs and proudly parenting their daughter, Brittan, and son, Will. The optimistic Sooi-Kit Cheng, or “Cheng” as we call him, is Café Intermezzo’s Controller. Though payroll, financial statements, and sales tax filings are a few of his primary duties, he’s always willing to pitch in with other tasks when needed. He’s even stepped in to handle with cheesecake deliveries! Though originally from Malaysia, Cheng received his college education in Georgia, at both UGA and Georgia Southern. While a Bulldog, he gained unique perspective on the food industry as an employee with the UGA Food and Science lab. While later living in Statesboro, Cheng worked in food service for the university, and then at Braswell’s Food Company, where he was the 'Food Technologist.' While in that post, he managed quality control, research and development, food safety, and government regulations. 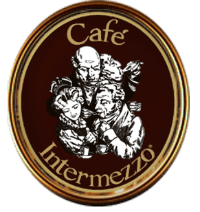 He says that he originally became intrigued by the Café Intermezzo concept because it's "a romantic place to be." When he isn't crunching the numbers at our corporate office, Cheng enjoys staying abreast of current affairs through reading the news. Emile Blau is as close to native Atlanta as one can be – all but two years. He grew up in Sandy Springs and has never ventured too far from his home roots. His background spans so many aspects of hospitality -- a waiter at the Standard Club and eventually leaving the Club as their Clubhouse Manager. A short stint at the once popular Hamburger Hamlet – and then to his long tenure as manager and then general manager of Bones. Emile was the general manager of Chops/Lobster Bar before purchasing the iconic American Roadhouse. He has consulted for many restaurants and country clubs and most recently opened the Hotel at Avalon as their Director of Outlets – overseeing Starbucks, Room Service and South City Kitchen. There are a few constants in Emile’s history -- his work ethic, his ability to run operations at peak performance, and his distinct brand of hospitality. It is ALWAYS about the guest and the staff. His passion runs deep for his staff and their quality of life. Always give the guest more than they would ever expect. Emile experiences joy by serving others. When not working Emile enjoys playing golf. The solitude of a beautiful golf course and comradery of great friends make for the perfect day away. Step foot into Café Intermezzo at Avalon, and you’re likely to be greeted with a huge smile from General Manager Joy David. She’s brought an infectious energy and upbeat, can-do attitude since Avalon’s very first day, in December 2015. But long before joining our team, she spent her youth in Bangkok, Thailand: her homeland. There, she was inspired by the bustling street life, and enjoyed the culture and spices found in the open-air markets. Joy escaped the gusts and freezing winters for southern heat and humidity, when an opportunity arose to manage a top-volume store for a major national chain in Buckhead. There she remained for several years, earning multiple awards along the way. And that is where Café Intermezzo entered the picture. That mission, Joy certainly accomplishes. In her spare time, she gardens, does yoga, goes shopping, and spends time with her husband and two children. Favorite quote: "Love what you do and do what you love!" Ahmet Toker, General Manager of our Dunwoody café location, describes an experience many citizens of this country have had to navigate in their own moves to the U.S. Arriving knowing no English, and worried about how how socializing would work as a result, Ahmet was surprised by the warm reception and patience displayed by those he met when he began studying at the University of Georgia. There, he worked as a dishwasher for the UGA dining hall system, and climbed his way up the chain at Damon’s Steakhouse, while learning English and completing grad school. Shift-leading at Damon’s earned him a spot first as unit, and then eventually district manager for Waffle House. Some early lessons, he hasn’t forgotten. After ten years with Longhorn Steakhouse and one-and-a-half with Ruby Tuesdays, Ahmet has been in America for decades. But his Turkish roots will always make up his fabric. He’s got a Geophysics degree and a minor in Geology from Istanbul University, and fondly remembers days at Turkish coffeehouses.